A rhythmic series of dull beats emanates from inside the exhibition space at Sidney Cooper Gallery. Selina Bonelli, one of the five artists selected by Threads Kent for today’s one-day residency, sits on the floor and cradles a small wooden log between her ankles, steadily removing its bark in an attempt to reveal the solidified memory of the felled tree in a kind of ritualistic carving. Meanwhile, artist Wes Gilpin can be seen digitally modelling a pair of hands for his short animation, Tomasso Gorla is obsessively drawing and erasing pencil lines on multiple sheets of paper, Sophie Bament is carefully stitching serviettes into a large bib and Nathan Caldecott is assembling empty mobile phones before arranging them in neat rows on the gallery floor. 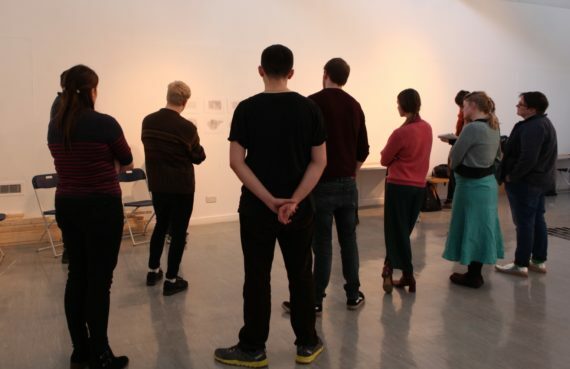 Having been selected from an open call, they all met with Threads’ artists-curators for a closed crit in the morning and proposed ideas to develop in the next few hours. Most of them had wished to test out certain concepts and processes for some time but had not had the opportunity to throw themselves into free experimentation, or a kind of purposeful play essential to building sturdier notions. This is precisely what the micro-residency offers to creatives in a similar position – a supportive environment available for an exchange of reflections, questions and advice throughout the day and a final gathering in an open crit in the evening. Each artist then had a chance to present their work before the assembled group which further discussed their creative process, intentions, possible new shifts and what the residency meant to them. The debate seemed to be a truly genuine space for sharing findings and developments but also doubts or errors. One of the most interesting aspects of residencies in various locations – Threads will stage them all over Kent, such as Folkestone, Dover, Canterbury, Margate and Sittingbourne – are the interactions between the works in progress and the specific qualities of the residency places. Wes Gilpin, for example, found an ornamented plate in the gallery which prompted him to start thinking about what this object could say to him. By the end of the day, he created a short video in which the plate – edited into a more sinister, red-green smiley face – orbits around, telling us about the expressions it can make. For another artist, Nathan Caldecott, the process of laying out his hollow mobile phones on the gallery floor started as a contemplation of order, of a kind of performative construction. However, the open exchange of ideas and interpretations during the public crit revealed other potential meanings in his work as the group members pointed out the dialogue between the reflective screens of the mobile phones and the vertical lines of the blinds on the gallery ceiling. The artist’s photographs of the aligned phones became instrumental, in the eyes of the group, to expanding the potential of the piece, shifting the original emphasis envisaged by Nathan. Such discursive and collective approach to art (and meaning) making exemplifies the strong desire among practitioners for a more responsive, fluid thinking process. And for taking the time to do so, as, in Selina Bonelli’s words, ‘nowadays, slowness is an intervention.’ It seemed that all participants benefited from having a day for uninhibited, paid trialling of their ideas without having to worry about a particular outcome. Not restricted by a specific intention but still staying focused, having only one day but not feeling rushed, giving oneself the thinking space in opposition to today’s over-productive, instant, goal-driven society felt invaluable to achieve a certain level of intimacy with one’s art. As more crits, residencies and salons will take place in the future months, it will be fascinating to watch new cohorts of artists enjoying this opportunity, emptying out their minds and letting different locations guide them instead.